So now, what about all those hundreds of thousands of photos in your WordPress that are not linked with your Lightroom? Well, you can link them using the “Total Synchronization” features! Let’s do it: this module is accessible under the menu “Library > Plug-in Extras”. There are two ways of linking your WP photos and with your LR’s ones. I suggest you to start with the automatic matching first, then finish-up with the manual matching if you have any not-linked photos left. The automatic matching attempts to match the photos between WordPress and Lightroom. This matching is done by comparing the metadata, and, if not available, by using perceptual hashing. This hashing is slower and generally less accurate but provide perfect results if the photos are actually similar in your WP and LR. The module is accessible through Library Menu > Plug-In Extra > Total Synchronization. Starting the process is very easy. Make sure the WordPress website is selected (on the left) and that enough photos are selected on the Lightroom (on the right, you can work with a selection of photos or all of them). Click Start! Then you might want to go to bed. Depending on the number of photos and the need of hashes, that will take some time. Many requests will be performed to your WordPress server. This is usually fine, however, a few hosting services might terminate those requests abruptly. If you get the “Got an error from WP” message, please check the FAQ. As new matches are found, they are added to the screen. When the whole process ends, you will be able to use the actions at the bottom. CLEAR. Remove this match from the screen. It does nothing to your LR or WP. Basically that is just to clear your dashboard from the matches you are done with. LINK. The actual linking is done through this button. The LR image will be moved to the Publish Service (as a “New Photo to Publish”) and the image on WordPress will be marked as linked. LINK + NEXT. Same as above. Then it moves to the next match! You might especially want to use that button since it is convenient. If you make a mistake, the “Unlink” button will rescue you. UNLINK. Did you link two images by mistake? No worries. You can use this button to un-link them. IGNORE. You might have external images, logos, icons and so on in your WordPress. By ignoring them, you will never see them again in WP/LR Sync. Once you are done with all your matches, you can Publish the changes. 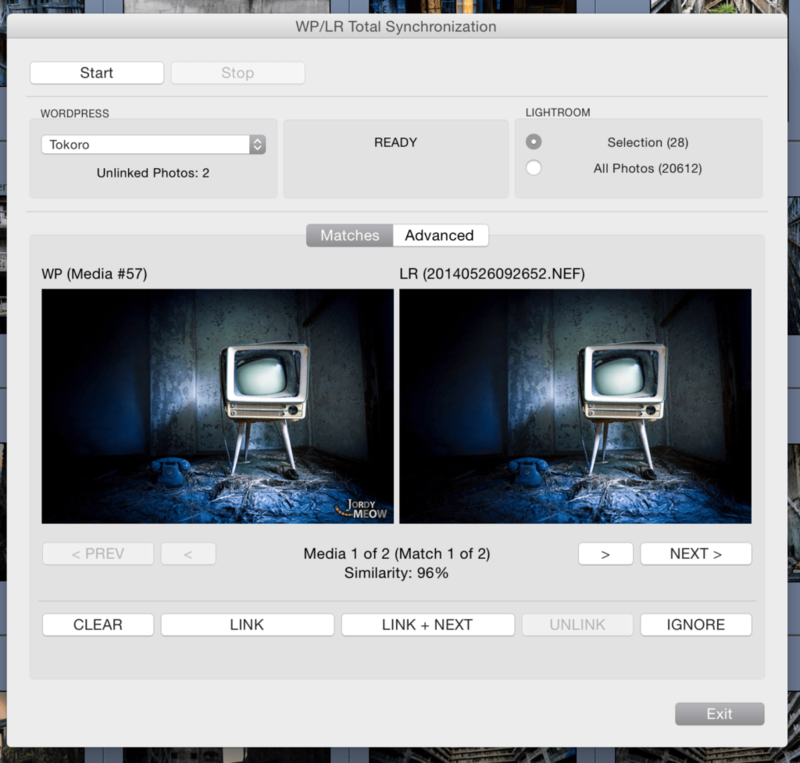 Fresh images will be applied to your WP Media Library. The same photo might sometimes looks very different between your WP and LR because of post-processing, cropping, rotation, etc. In that case, the automatic matching might not work and you will need to do it manually. That’s where the Advanced tab comes handy. Start with Get / Refresh Statistics. The number of Hashes and IDs will be updated. We don’t care about the hashes here but we do need all your photos to have IDs. The ID is an unique reference to a photo in your LR. Since those IDs are not accessible normally, you need to click on Create LR IDs (very fast) then it will be available in the Metadata, like below, in LR ID. 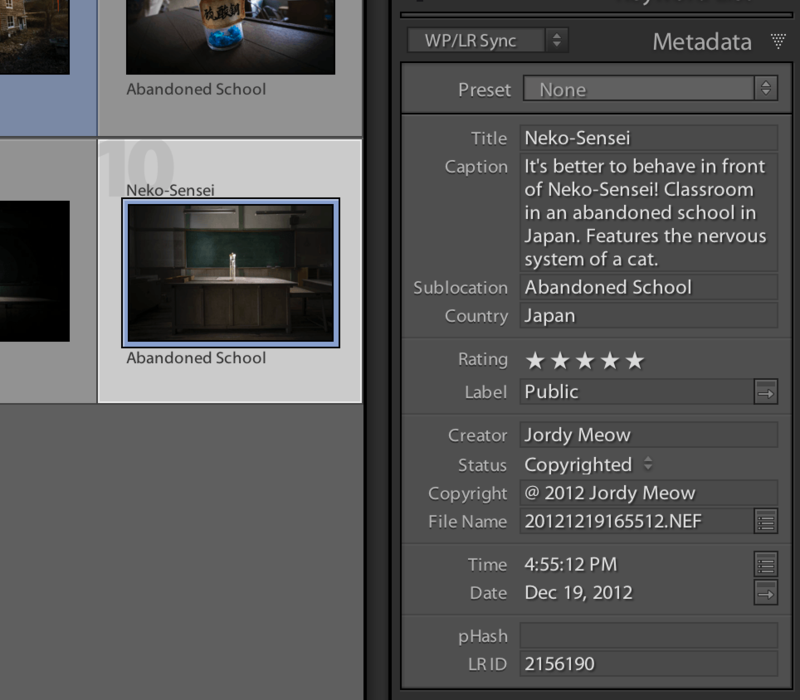 I suggest you switch to the WP/LR Sync preset (in Metadata) that shows all the information you might need. 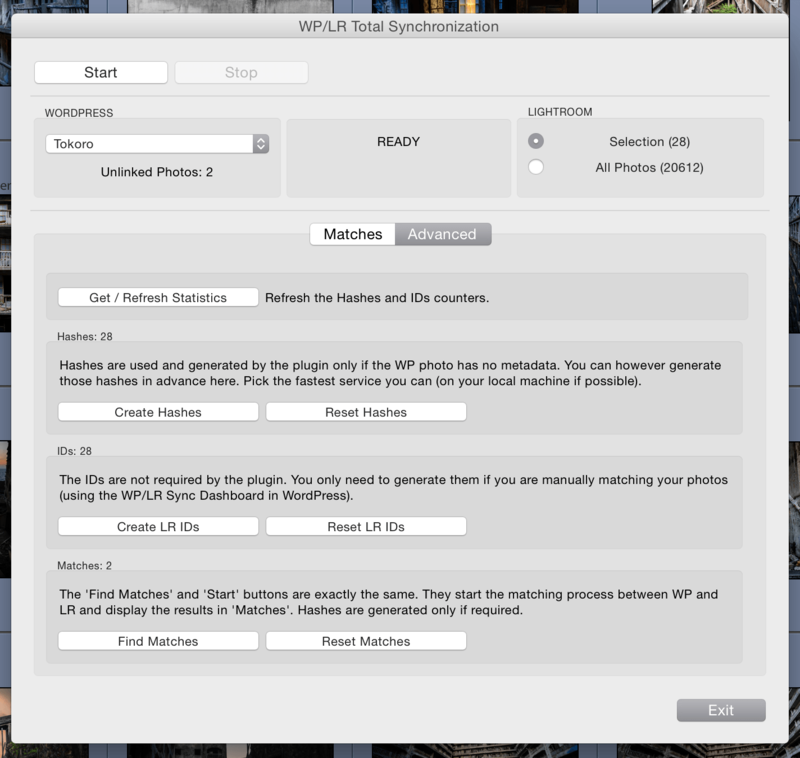 The manual matching has to be done on Lightroom and WordPress. When the photo is not yet linked to LR, its status (in the Media Library) is marked as “Unknown” and a text box can be found below. You can copy/paste the LR ID you got from LR in here and click Link. Then, immediately, you need to drag & drop the photo in the Publish Service’s folder Photos. Those two photos are now linked! During the next “Publish”, the photo will be replaced with a fresh one using your export settings. You can also check your Settings -> Media to enable the WP/LR Tools then you will get a WP/LR Dashboard in the Media menu. With this dashboard, you can directly see and work with the Unlinked Photos and Duplicates.